Lions, and tigers, and Gators’… Oh, my! When you think of Florida, I am sure that alligators are one of the first things that pop into your head. Maybe you are scared of seeing one, or maybe you are intrigued by one of the many alligator attractions around Florida. 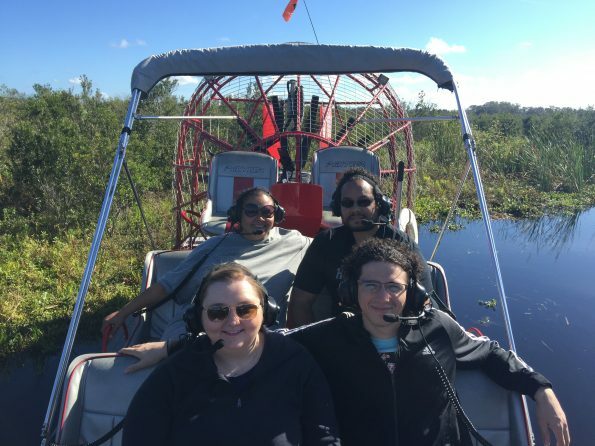 Personally, I was very intrigued by them and had the adventure of a lifetime taking a Spirit of the Swamp Airboat Tour to see some alligators in their natural habitat. 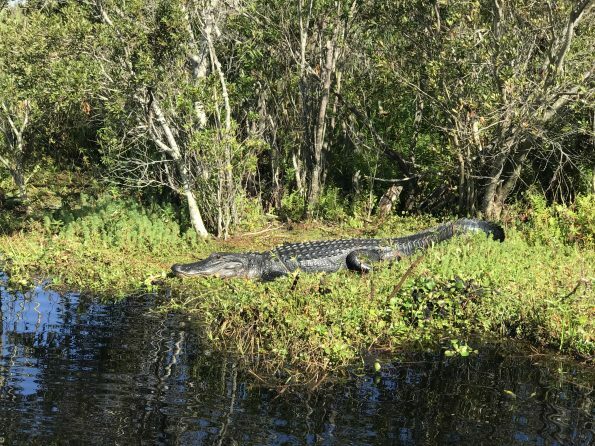 I really wasn’t sure what to expect when I booked the tour, but I was excited at the prospect of seeing alligators in their natural habitat, and the tour did not disappoint. We went at the perfect time because we saw multiple alligators and had so much fun on the tour. 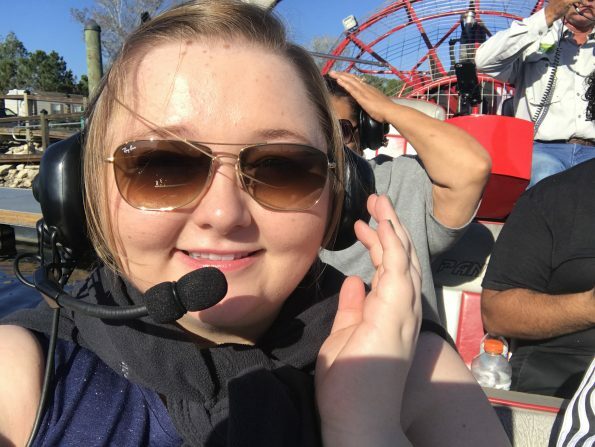 When you visit Orlando definitely make sure to book this tour, and if you aren’t convinced yet, keep reading ……..
1. What is an Airboat? This was one of the things I really wasn’t sure of when I booked, but it turns out airboats are actually pretty cool. The airboat is flat and has no operating parts that sit below the water. It seems as if you are gliding on top which makes for fun tricks and a smooth ride. 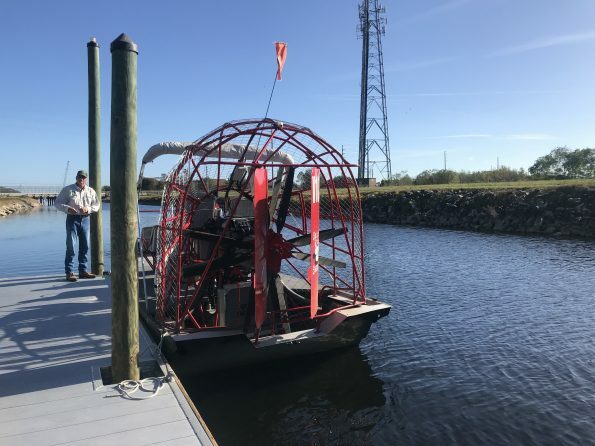 The airboats have a propeller on the back that looks like a giant fan, and one thing to keep in mind is they are definitely loud, but Spirit of the Swamp provides you with headsets for ear protection and communication. I can’t say this enough, the boats are definitely safe! The captains are experienced, even when we were going fast and doing tricks. I was never once scared. It was just thrilling. Another question I received a lot from Instagram was if any alligators climbed onto our boat. The answer is no. You will be safe. For obvious reasons, you are not allowed to feed or touch the animals. These are wild animals and should just be viewed, not touched. Although the little baby gators are so cute and you may want to pick them up, DO NOT! The mama is always close by and I guarantee you she has her eye on you. Like any other tour involving animals in their natural habitat, you are never guaranteed to see anything. However, the captains are experienced and know what to look for when operating the tours. 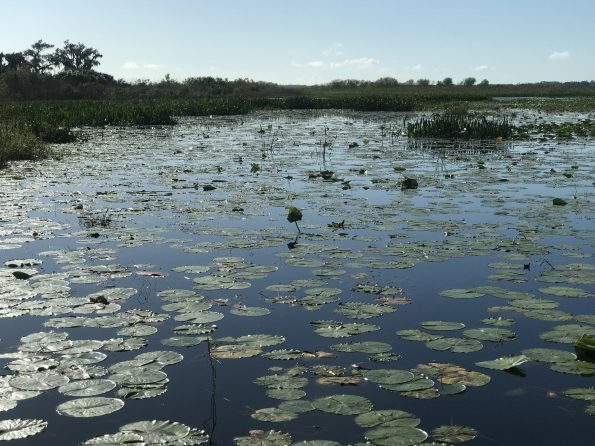 On my tour I saw at least 5 alligators as well as some babies in a nest, different birds, and you are able to see the beauty of the swamp that you are traveling on. As I have learned from doing many animal-related activities, the animals are more active in the morning. You can really wear anything you would normally wear when you are out and about. Casual clothing such as shorts, sandals, and t-shirts are completely fine on warmer days. If it is colder out you may want a jacket and pants. Either way I would definitely wear sunglasses and sunscreen! Protect your skin, always. Also keep in mind that you will be wearing headsets not only to protect your ears but also to communicate while the boat is moving. The airboat does get loud, so you need these headsets to talk to both the captain and the other people on board. 5. Why do I recommend Spirit of the Swamp? I had the most amazing time on this tour. Everything was so easy, from contacting the company and booking my tour, to getting on the boat. Captain Dale was so knowledgeable and knew exactly what to look for so we could see some alligators. He made the tour fun by going fast and doing tricks, but he also taught us a lot about the airboats, the swamp, and the animals. Debi is the owner and who I was in contact with when booking. She is so nice and always replied quickly and efficiently. Overall everyone I encountered was kind and helpful. The boats are in great condition, and the location of the tour was great. The tour is also very affordable, and the amount of time you are on the water is longer than a lot of the other companies I had researched. Spirit of the Swamp offers 3 options for the airboat tours. The prices are per person, and another great thing about this company is if you have 4+ people in your group, then you can request a private boat. This is much nicer than being on a boat with 20+ people because you just experience more. You can talk with the captain one on one, move around the boat without getting in someone else’s way, and have a more intimate experience overall. As I said earlier, my experience with Spirit of the Swamp was truly wonderful. I had three friends on the tour with me, and we all agreed that this was our favorite thing to do on our trip to Orlando; it was even better than Disney World. By taking an airboat tour you can experience alligators in their natural habitat, and that is something very special. I promise you will not regret booking this tour!